An illustrated talk by Steve Foottit. aspects of the cathedral that visitors often miss. Harrowby Lane Methodist Church Community Centre – 7.30 pm. An illustrated lecture by Dr Jonathan Foyle. A treat for both history and literature ‘Buffs’! Jonathan is an inspired speaker and his lectures are always fascinating and thoughtprovoking. He makes regular appearances on television and is known for his series ‘History Mysteries’ and ‘Hidden House History’. Jonathan has written several books on history and architecture. Not to be missed! Venue: The Urban Grantham Hotel, Swingbridge Road, Grantham, NG31 7XT. Time 7.30pm £7.00 per ticket. Tickets are on sale now – please see MAUREEN WHEELDON, Cheques to Richard III Society Lincolnshire Branch. the famous Barkers department store. There are plenty of places to get lunch. away in the Vale of Mowbray. Friends and family are welcome to join us. PLEASE BOOK WITH JEAN NOW. payable to JEAN marked ‘Northallerton’ on the back. Coach pick up times: Wright’s Depot 8.15 am, Balderton 8.30 am, Long Bennington, Royal Oak 9.00 am. Time: 7.30 for 8.00 pm. Price: £21.95 for a 3-course meal, tea/coffee. Cheese board is £1.50 extra to be paid when booking. Menu choice available from Jean. should be handed/sent to our Treasurer, Ruth Meates. Please see the back cover for Ruth’s address. on the back, but please give each an appropriate title! A fabulous prize awaits the winner, with prizes for the runners up. Jean will also devise one of her fiendish quizzes with yet another exciting prize for the winner. An illustrated talk by Kevin Winter. also Custodian of the human remains from the battle of Stoke that were found in 1982. The talk will explore the last battle of The Wars of the Roses and discuss the continuing struggle to protect our battle sites. Blow away those winter cobwebs and get out and about by coach and with an inclusive lunch. PLEASE BOOK WITH JEAN ASAP. Coach pick up times: Wright’s Depot 8.30 am, Balderton 8.45 am, Long Bennington, Royal Oak 9.00 am. An illustrated talk by Matthew Lewis. Roses and Richard III, in particular. familiar to King Richard. Raise your glass to the last Plantagenet King of England. You can choose your lunch on the day but the hotel does require £5.00 deposit per person. Please book with JEAN by the end of FEBRUARY and include your £5.00 deposit payment. This is an ‘own cars’ excursion. Anyone requiring a lift should please see Jean. *Bestwood Lodge Hotel, Bestwood Country Park, ARNOLD, Nottingham, NG5 8NE. By popular request. This will be our annual St George’s Day celebration and it has turned into a patriotic and enjoyable evening. Add prestige to the occasion by wearing something red and white - St George’s colours. The venue will depend upon numbers. Please book with JEAN by the end of FEBRUARY. There will be no charge for this event. An illustrated talk by Tim Sutherland. and the long search for its remains. as it contributes towards speakers’ fees, venue charges and our charitable donations. Would each member please donate a prize for the stall, anything new apart from tinned food or alcohol. Or give a cash donation. Please give prizes and offers of help to any member of the Committee. An organised table of helpers can then be drawn up. have Jonathan as our very own tour guide! There will be a suitable visit/lunch stop enroute on both the outward and return journeys. Cathedral and has very good reviews. Price - £320.00 per person includes all coach travel, 3 nights bed and breakfast, guided tours and hotel porterage. £20.00 per person at the time of booking. marked ‘Wells’ on the back. The full amount must be paid BY THE END OF MARCH. 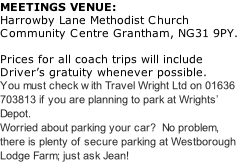 Coach pick ups: Newark, Balderton and Westborough Lodge; times to be advised. like Jean to source or book a restaurant close to the hotel, please ask. Prior to visiting Bruisyard Hall, there will be a lunch stop at Stowmarket, where there are many places to have a good lunch. Stowmarket Church contains the burial vault of the Tyrrell family of Gipping, with monuments dated from 1449 to the 18th Century. the supposed murderers of the Princes in the Tower. to see the interior of this hidden gem. Refreshments will be served after the tour and Jean understands that there will be cake! Please book with JEAN by the end of MARCH. require a pick up en-route other than those stated. This is in aid of Branch Funds and is an important fund raising event. meet costs that increase year on year. We are also keen to support churches and historic sites by offering charitable donations. Venue – To be advised. Auction starts at 7.30 pm prompt. A talk by Keith Jobling. Keith is a former RAF V-Force flyer, an accomplished choral director and musician. you will also see the beautiful artefacts for yourself as they will be on display during the evening. Come along and be enthralled! Venue: The Urban Hotel Grantham, Swingbridge Rd, Grantham, NG31 7XT. An illustrated talk by Jean Townsend. saints, burial customs and the often bizarre attitude towards bodies by people in the past. Please note that this talk will not cover the excavation of Richard III. We will have a raffle and a book stall. Please donate raffle items to MAUREEN WHEELDON and books to STEVE FOOTTIT. Tickets £5.00 – includes tea/coffee and cake. Offers of help and home made cakes please! Richard III Society Lincolnshire Branch. Answers to Jean in an envelope prior to the picnic. There will be a prize for the winner. By popular request, we will have another coach trip and mystery tour. The usual picnic format will apply; bring your own chair and a picnic lunch. If the weather is poor, we can picnic on the coach. and a yummy afternoon tea. Price - £.36.00 per person - includes coach, morning coffee and biscuits, all visits and afternoon tea. A very cheap day out! Coach pick up times: Wrights’ Depot 8.30 am, Balderton 8.45 am, Long Bennington, Royal Oak 9.00 am. Attendance by ticket only. Book with JEAN. There is no charge for this event, which is held in the afternoon; time to be advised. comes recommended for its good food and clean rooms. It has good reviews online. insurance can be arranged at £28.00 per person, payable at time of booking. PLEASE NOTE - We must have at least 20 people to secure this price so please advertise this trip. PLEASE BOOK WITH JEAN NOW WITH A £50.00 NON-RETURNABLE DEPOSIT PER PERSON. Cheques payable to JEAN, marked ‘Bayeux’ on the back. Please note that the full amount must be paid by the end of JULY. Coach pick up times to be advised. Please note, Jean will show slides of the year’s events after the meeting. We are very much indebted to our Branch Secretary for the hard work she has put in when arranging this varied programme. Please show your appreciation by helping arrangements to run smoothly. Members are asked to book early, using the slips provided and to pay by the dates specified. Please write the event being booked on to the back of your cheque. Further payment information can be found on the back cover of the programme. The Branch is not able to take bookings without a properly completed booking slip.